Psychrometric Chart is together with HVAC_Simply and Mollier Diagram part of Tadema HVAC Software. Piet Tadema develops simulation software that facilitate HVAC professionals around the world with their day-to-day work. 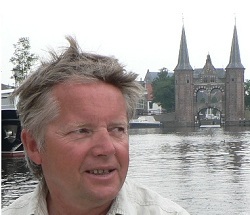 Piet studied electrical engineering In Zwolle in the Netherlands. I worked several years as measurement and control technician and service tecnician. During my career I specialized in control engineering, air treatment and cooling technologies. Often I have experienced a lack of good applications that would support me in my daily work. In these cases I usually used my laptop for calculations in Excel. However, I missed a handy program for quick air-treatment calculations at the workfloor. Most applications are expensive and very hard to use. So I applied my knowledge about air treatment with my 30 year experience in programming. The result was first Mollier Diagram Pro and later the revised version including Psychrometric Chart.